This entry was posted on June 27, 2014 at 12:49 pm and is filed under History, The Universe and Stuff with tags correlation dimension, cosmological principle, Fractals, Jun Pan, large-scale structure of the Universe, PSCz survey, WiggleZ. You can follow any responses to this entry through the RSS 2.0 feed. Responses are currently closed, but you can trackback from your own site. And well, well, well, within the observable universe. A second opinion is that nature’s hierarchy appears to top out at about the point that our observational capabilities approach their limits. Were our observational capabilities change to allow observation of larger scales by a factor of, say, 10 to 1000 or more, then our conclusions regarding the extent to the hierarchy might be quite different. In a discrete fractal cosmos, and there are various fractal models with QUITE DIFFERENT properties from the usual assumption of continuous fractal modeling, the current observations could not be used to rule out a fractal cosmos. A scientist does not say that the cosmos is not fractal, but rather takes the more scientific stand that the cosmos might be fractal but that within the limits of the anthropocentric observable universe nature’s hierarchy appears to have a turnover to a uniform distribution of matter on scales of about 80 Mpc, according to current but evolving estimates. The turnover to homogeneity happens well within current survey volumes. I’m not sure I understand your later comment, which seems to say that if it’s shown not to be a fractal than it can still be a fractal if you define a fractal to be something other than a fractal. Peter, without taking sides over cosmological fractals, there are ‘free’ parameters in fractal models, ie values not specified by the model, which are to be estimated from the data. I think the “later comment” is a variant of the “no true Scotsman” fallacy, i.e. redefining something whenever evidence contradicts it so that the new definition is in accord with evidence at the time of the redefinition. Trivially, the universe could be fractal on scales much larger than the observable universe. By definition, there is practically no way to disprove this. But it neither makes a testable prediction nor does it stem from some otherwise useful theory. This is otherwise known as “moving the goalposts”. 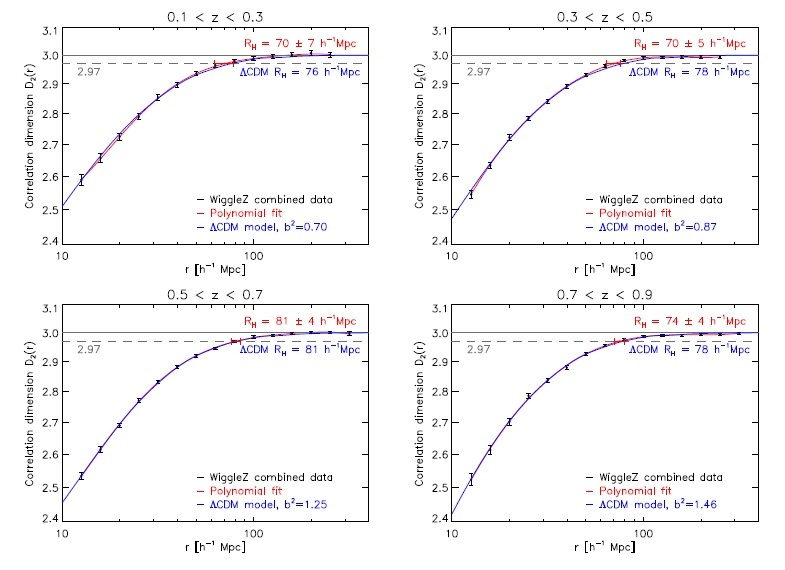 Another example from cosmology: A well known problem with the concordance model (though the degree to which this is a problem is a matter of debate) is the low power at low CMB multipoles. A universe with non-trivial topology, say flat space in a 4-D torus, i.e. a spatially closed universe with zero curvature (not possible with a trivial topology), would have lower power at lower multipoles. People have investigated this, but other signals of such a “small universe” have not been found, so in any interesting sense this has been ruled out. Of course, the universe could be such a torus with the relevant scales much larger than the observable universe. It can’t be ruled out, but it’s not an interesting idea: it doesn’t make any testable predictions, and it doesn’t follow from some other useful theory. 80 Mpc is well, well, well, within the observable universe and well, well within the reach of current surveys. There is no rand effect there, so this opinion is manifestly wrong. By your liberal standards, a scientist should be open to the possibility that, on scales much larger than we can observe, the cosmos is shaped like Homer Simpson. Speculation on observable things per se is not scientific. Another approach is to consider well tested theories and ask what they predict about unobservable regions, e.g. what does GR say about the interior of black holes. Current speculation about the multiverse is more akin to this. The key point is that the theory on which the speculation is based be sound; if it has been falsified since its own definitive, prior, quantitative, non-adjustable predictions were not observed, then such speculation is clearly a waste of time. In other words, no-one considers the Homer-Simpson possibility because there is no other evidence to support it. Same with the fractal idea. I’m reading Edward Harrison’s Darkness at Night, in which he points out that fractal models of the universe were considered and did get attention in the past. However, they have now been ruled out. Science evolves. “Trivially, the universe could be fractal on scales much larger than the observable universe” — That does not make sense. By its very definition, if you take the definition seriously, a fractal applies at ALL scales. That is why we know the universe is not fractal. Yes, that is why I asked Phillip on a previous thread what he meant by “fractal on large scales”. He answered: “a Charlier-style universe which is self-similar at all scales”, which probably means more to you than to me. Why ask Mr. Helbig anything? He is a font of disinformation and unscientific absolute certainty. The Rush Limbaugh of cosmology. GFR Ellis has apparently not considered discrete fractals, which are NOT self-similar at ALL scales, but only at discrete intervals of scale. Should I repeat that for the hard of hearing? There is such as thing as a discrete fractals and examples are given in Mandelbrot’s seminal book. Telescoper also seems to completely ignore my oft-repeated pleas for people to stop thinking that a fractal must be self-similar at all scales. Over and over again I have said, and Mandelbrot has demonstrated that the absence of obvious fractal structure (aside from the entire cosmic web which is highly fractal) does not mean the end of nature’s hierarchy, or that strong inhomogeneities cannot emerge again at a higher scale. The definition of a fractal that I am familiar with is one that is self-similar on all scales. If you choose another definition, I suppose that’s up to you, but it doesn’t help. The hierarchical structure of the Universe is broken on small scales and large scales so it is not a fractal in the usual sense. Charlier’s universe has galaxies, clusters, superclusters, supersuperclusters and so on ad infinitum. So, at scales larger than a galaxy it is self-similar but not at smaller scales. (It is interesting because it could have a dark night sky even with infinitely old stars in an infinite universe.) It is often referred to as a “hierarchical universe”. What I meant by “fractal at large scales” (sorry for the imprecise terminology) is something similar (no pun intended) but with the smallest unit larger than the horizon, which is what RLO seemed to be implying. 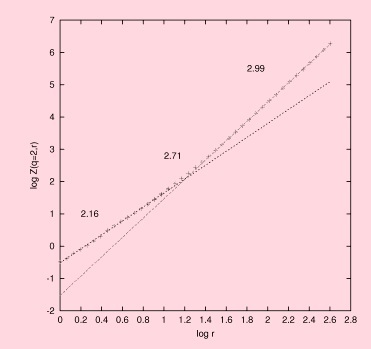 There is a great deal of difference between a situation in which somebody proposes a model having ‘floating’ parameters ie parameters whose (fixed) values are to be estimated from the data (these estimates may of course be revised as technology reduces noise in data), and somebody whose proposed model is found to be inconsistent with data and who then ‘floats’ a parameter of that model – a parameter whose value had previously been asserted. The latter methodology is not invariably wrong, but flotation of parameters is a warning flag that the path to epicycles is being taken. As I understand it, both RLO and mainstreamers are accusing each other of this. If you’re referring to the transition scale as a parameter, that’s not quite correct. It’s a derived quantity that is fixed when other parameters are known with sufficient accuracy. Now we have enough information we can predict various measures of the clustering pattern as a function of scale. In this case it matches well, though there remain question-marks over other measures. Peter, I wasn’t being remotely that specific! Yes, of course, a true fractal must be self-similar on all scales. I meant self-similar on super-horizon scales. Perhaps “fractal” should be used only in the strict sense, and “self-similar” if the self-similarity applies only over a certain range of scales (as when Peter mentioned that there is some self-similarity on smaller scales but not on larger scales; I meant the reverse). In Mandelbrot’s book one of the archetypal fractals cited is the Koch curve. There is a discrete scale factor of 3 (or 1/3 depending on how you look at it) in the construction. So the building blocks of the Koch curve form a discrete self-similar hierarchy whose size differs by a factor of 3 relative to a neighboring level. Of more relevance to cosmology is the intriguing toy model described by Fournier d’Albe (1907?) and discussed in Mandelbrot’s book The Fractal Geometry of Nature. The point F d’A was making was not to say the cosmos looked like his toy model, but rather to use the toy model to illustrate the interesting properties of discrete self-similar hierarchies. So discrete self-similar hierarchical models come within the general definition of fractals, at least to me they do. If one insists that fractals must be self-similar on all scales, fine. Then forget the “fractal” characterization and call it an unbounded discrete self-similar paradigm, if you like. The hierarchy has the same properties regardless of the artificial semantic conditions one tries to impose upon it. Interesting note: E.R. Harrison once told me that hierarchical cosmologies were a non-starter because they had a center of the Universe, and so violated the Copernican Principle. I tried to point out that the most natural hierarchical models, and those partially observed in nature, most certainly do not have such a center. I was shocked by his attitude toward hierarchical models. I have his unfortunate statement and related correspondence in print. Another interesting note is that GFR Ellis told me a few years back that self-similarity probably did not play an important role in astrophysics or cosmology. Hmmmm, perhaps we live in different universes. I also have this in writing. The bottom line is that Kuhn had it exactly right. Humans feel the need to hold on to their fundamental paradigms for dear life and to strongly resist any attempt to complicate things or consider fundamentally different assumptions. The idea of making a partial strategic retreat and then recreating a radically different paradigm based on a more secure empirical foundation fills them with insecurity and angst. They have spent decades studying the old paradigm; their status and daily bread come from not rocking the boat. Thankfully observers and experimentalists have different motivations. People consider different assumptions all the time, and then reject them when they’re excluded by observational data. It’s called science. You should try it sometime. Thomas Kuhn was a fine historian of science, but a lousy philosopher of science when he sought to draw abstract principles from his observations in science’s history. It is true, for instance, that we have a totally different understanding of the electron in quantum mechanics than in late-19th century classical mechanics. But it is false that quantum mechanics replaced classical mechanics as arbitrarily as a change in clothing fashion, as Kuhn’s work suggests (although he wasn’t that explicit, because then his error would have been obvious. That was left to wild men like Feyerabend). QM enabled us to answer questions that classical didn’t and couldn’t, whereas the converse was not true. Our model might change underfoot radically, but our ability to predict improves continually. What went wrong? Kuhn followed Popper (much as they disagreed) in rejecting inductive logic, yet inductive logic done correctly IS probability theory done correctly. Newtonian vs Einsteinian mechanics, for instance, is simply an Olympian case of comparative hypothesis testing using experimental data. Those data contain noise, of course, hence the relevance of probability theory. You say that the probability of Einstein in the light of the data is 0.999999 and the probability of Newton is 0.000001, and decide that Einstein is right. But if you reject induction, as Kuhn did, then you have no way of ranking theories/paradigms, and you say that they come and go arbitrarily. Nonsense! What should we do about the late Harrison? He can’t defend himself anymore. Apparently you failed to convince him that your type of models are important in cosmology. Whether they are partially observed elsewhere in nature is beside the point; you can’t assume “like below, so above” in some sort of great chain of being since that is what you are trying to prove. George is still very much alive; the question is whether he would waste his time defending himself. Two down, the rest of the community to go? I can just about stomach someone disagreeing with Harrison, or Ellis, on a minor point. But disagreeing with both on a major point is a pretty close shave courtesy of Mr Occam. “The bottom line is that Kuhn had it exactly right.”. Kuhn seriously misunderstood how science works, at least since it is no longer fashionable to burn heretics. That is certainly true in some cases. It seems to me that you are very attached to your discrete self-similar paradigm and have been studying it for decades. You can’t even envision that it might be the wrong paradigm. Right on. I’ll have to look it up, but I recently read an example where Feyerabend, or one of his cronies, actually saw the revolution brought about by the discovery of X-rays and radioactivity as a paradigm shift. What annoys me most about these types as that they completely ignore the role of empirical data! 2. Unscientifically *absolute* once again. I’m getting bored with this now. I’m closing comments on this piece. Apparently there is a new book on the Faraday/Maxwell collaboration on EM. The really nice thing about this chapter in the history of science is the separation of the conceptual/natural philosophy input from the analytical/ mathematics input since they were largely contributed by two different people with very different talents. Usually these two inputs are intertwined within one person or within a collection of individuals, and it’s much harder to differentiate them. Thanks for the thoughtful discussions. Time to focus on the wonders of World Cup 2014.